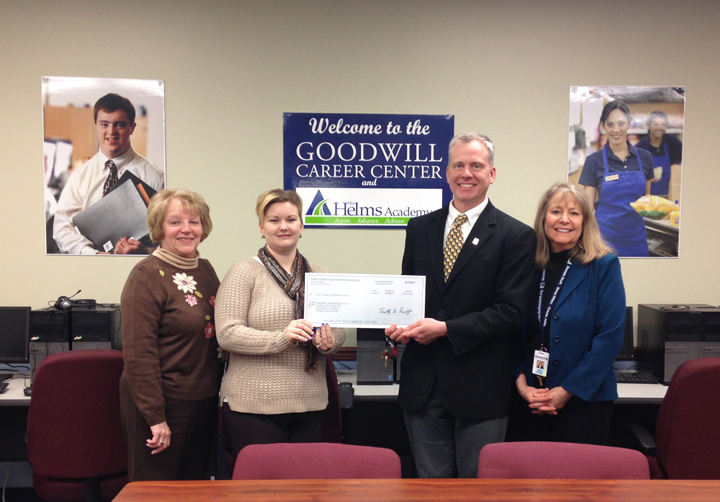 JOHNSTOWN, PA, January 19, 2017—Goodwill of the Southern Alleghenies has received a $5,000 charitable contribution from First National Bank (FNB), Central Mountain Region through the Pennsylvania Department of Community and Economic Development’s (DCED’s) Educational Improvement Tax Credit (EITC) Program. Goodwill is a state-approved Educational Improvement Organization under the program, qualifying the agency to receive contributions from businesses who apply to reduce their state tax liability. Charitable contributions to Goodwill of the Southern Alleghenies through the DCED’s EITC Program enable public schools to systematically choose Goodwill’s Innovative Educational Programs that are not feasible through schools’ current budgets. Goodwill will apply FNB’s generous contribution to support Innovative Educational Programs designed to help prepare youth for careers through a variety of career services including career exploration, career development, and employability skills training. Mary Lou Gelles, FNB’s Moxham Branch Manager; Krystal L. Hunter, FNB’s Downtown Branch Manager; Bradley R, Burger, Goodwill’s President/CEO; and Ann Torledsky, Goodwill’s Vice-President of Workforce Development. “Goodwill is honored to be selected by First National Bank to receive this contribution through the Educational Improvement Tax Credit Program, stated Bradley R. Burger, President/CEO of Goodwill of the Southern Alleghenies. Helping to mold today’s students into tomorrow’s prepared workforce is a strong vision at Goodwill,” he added.